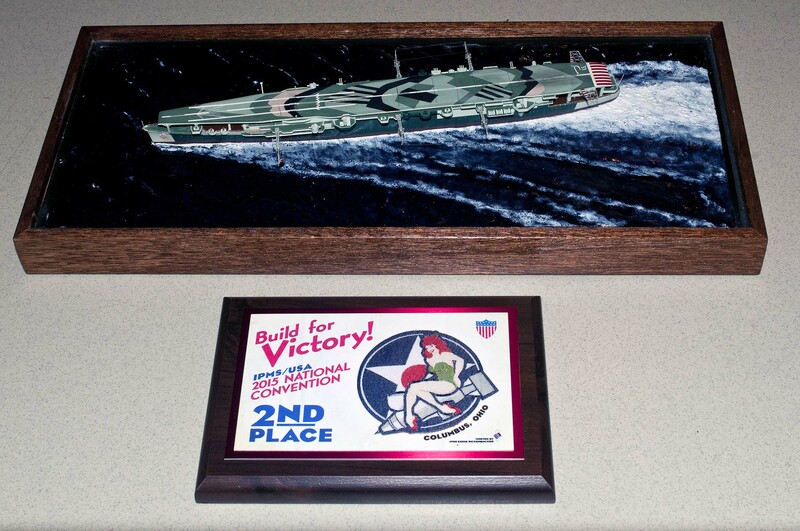 Charlie scratch built the flight deck and added other details to the carrier. I was amazed by the radio antennas sticking out from the flight deck in several places. All this was bent photo-etch – talk about tedious work. The paint job was superb. 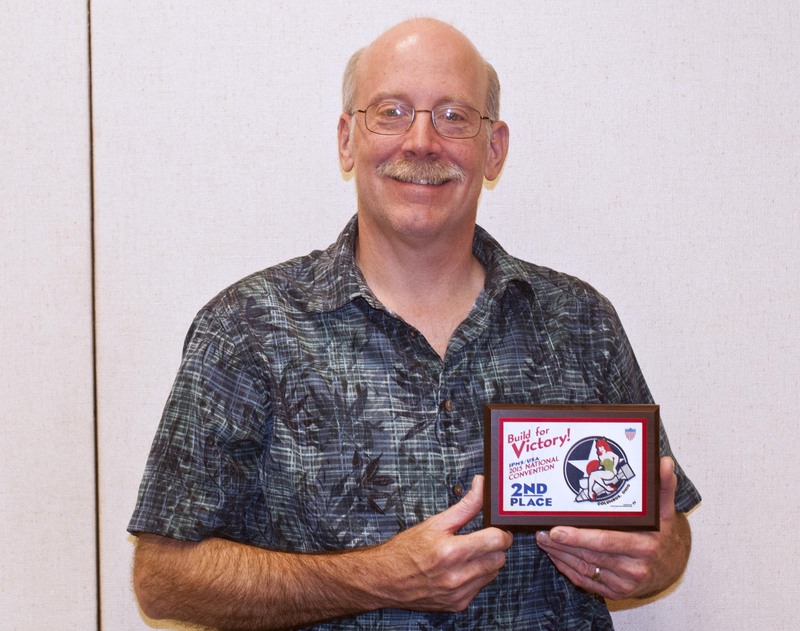 Charlie Scardon, proudly displaying his award – well deserved, a truly impressive build! 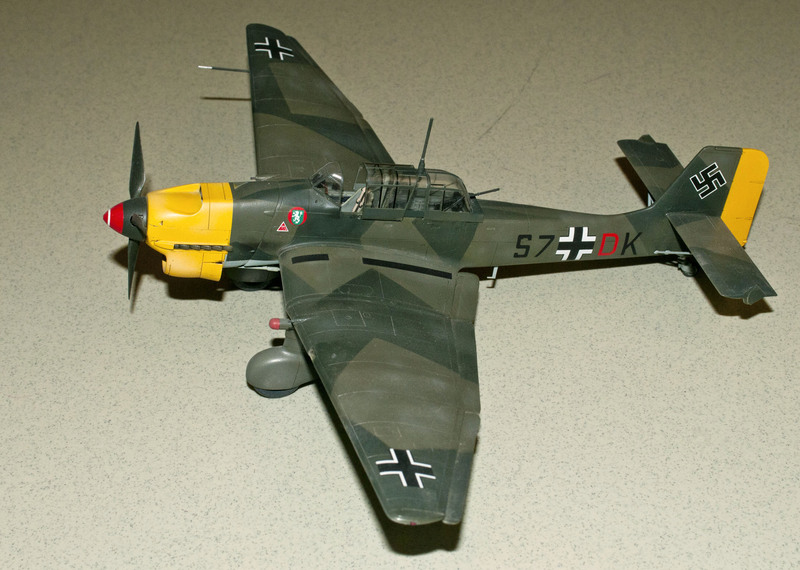 And now, the models on display at the meeting. 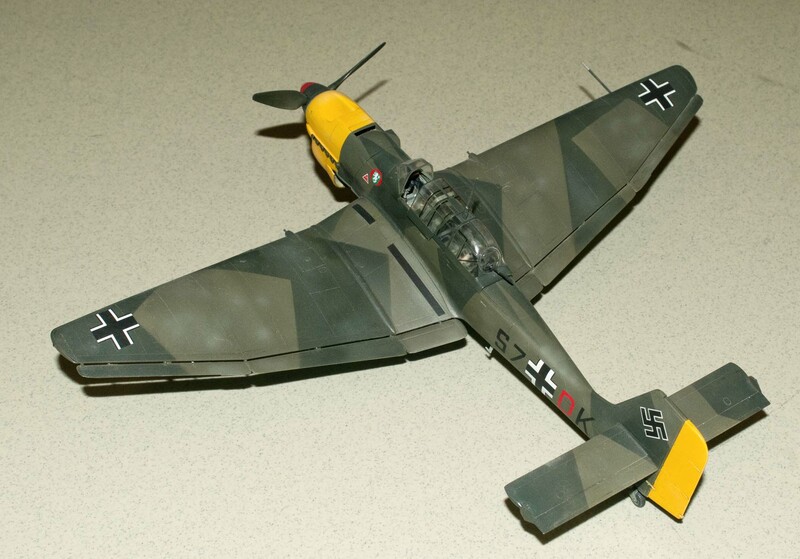 The Stuka was built OOB of the box. 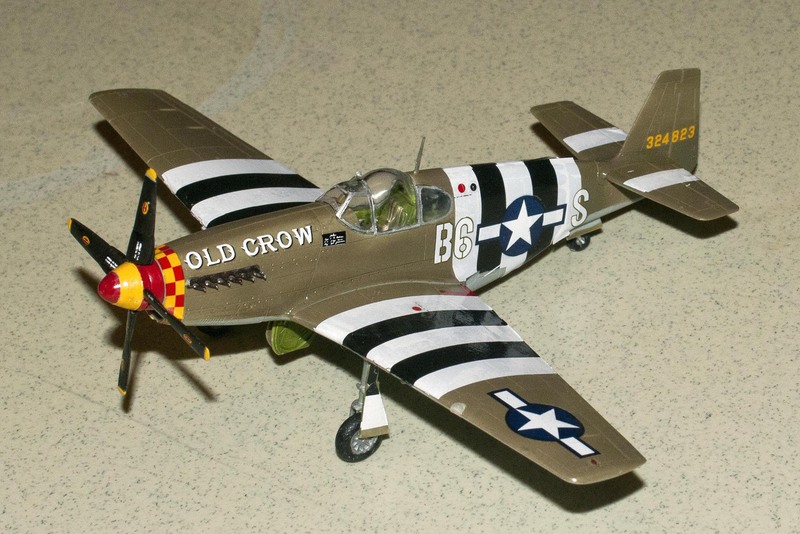 Eagle Strike decals were used. Mike indicated it was a complicated build. 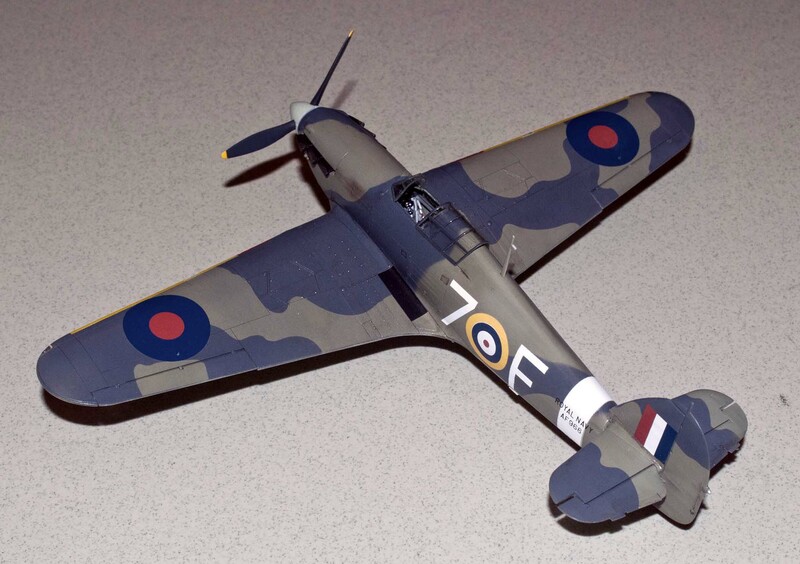 The Sea Hurricane was also built OOB. Mike indicated it was another complicated build, but went together well. He used Aeromaster Decals. 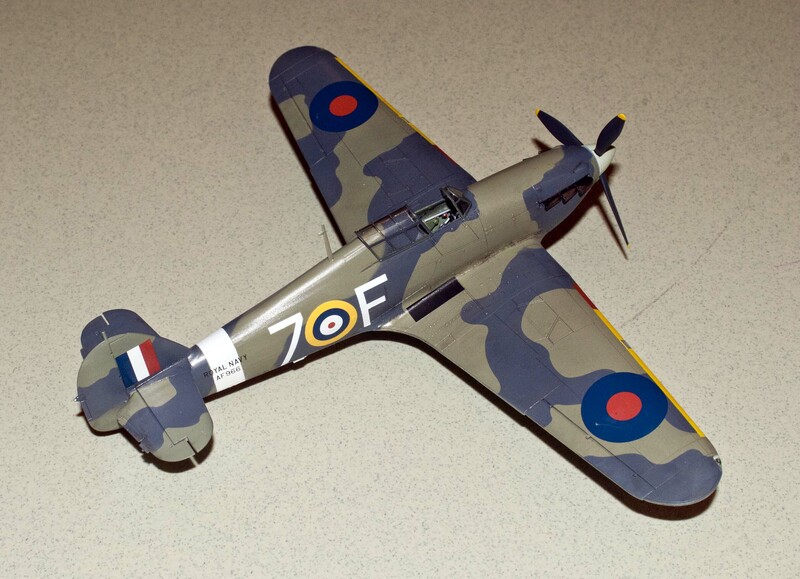 The type was used on the HMS Indomitable, launched in March 1940 and saw combat till the end of the war. 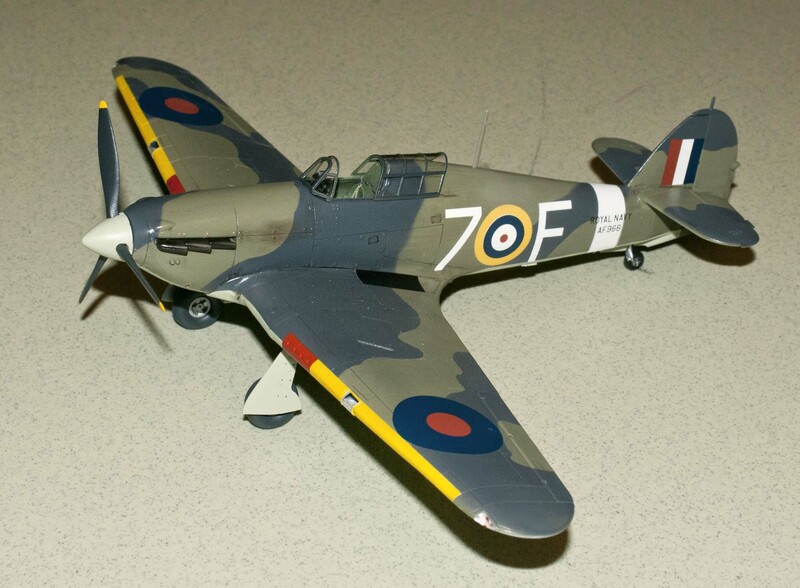 Mike said there were several options in the kit, which might indicate another version of the Sea Hurricane might be forthcoming. Steve had no idea what the type was till Lee Lygiros’s son gave us some specifics about the tank. According to the conversations going on it was considered a better tank than a German equivalent. 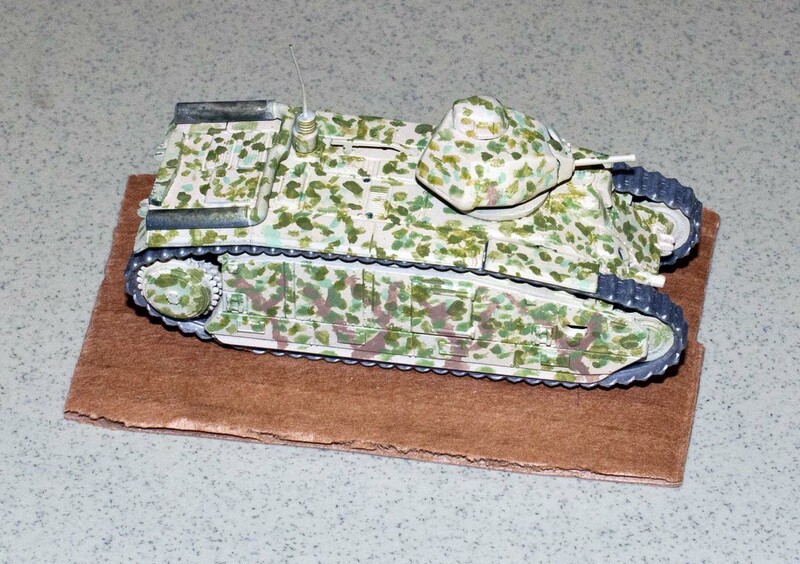 Steve liked the model because of the paint scheme and he did a super job with the camo. The Char B1 bis had a 47mm gun in the turret and a 75mm gun in the hull. Superior to most tanks of its day, it was designed to support infantry in a breakthrough through strong points like pillboxes, trenches and other fortifications. 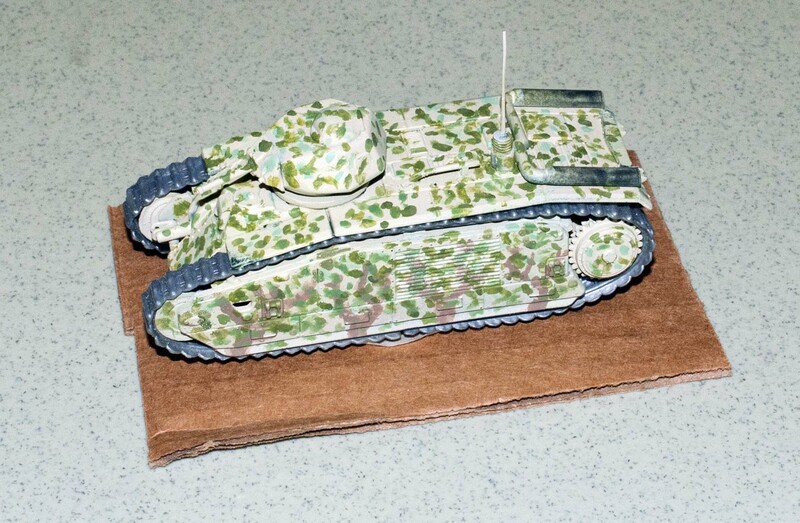 Consequently, the French generals had these tanks spread out to the point that they couldn’t counter the massed armor formations of inferior German tanks. The Germans got to send a lot of cool pictures home with them standing next to these monsters (look mom! See what I got! ), the top of the track was almost as tall as a man. 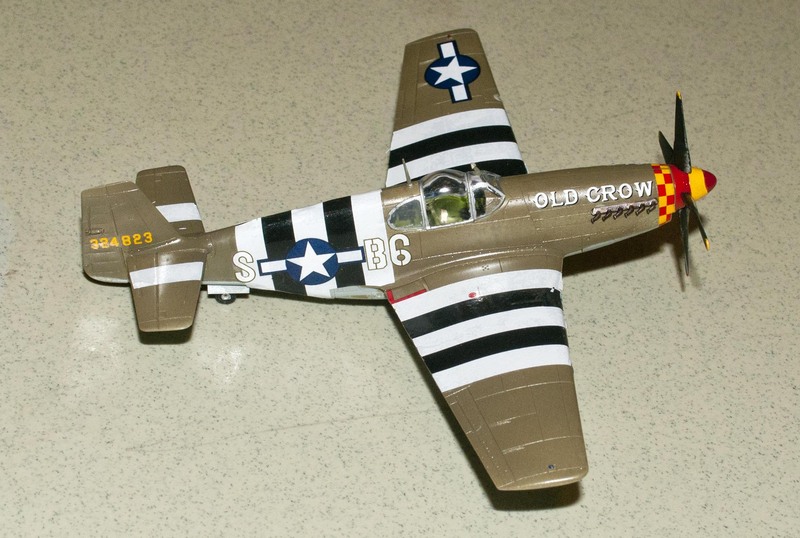 Jim built the kit OOB, using Eduard photo etch parts and Eagle Strike decals for the 353rd Fighter group, Maj. Frederick H LeFebre. 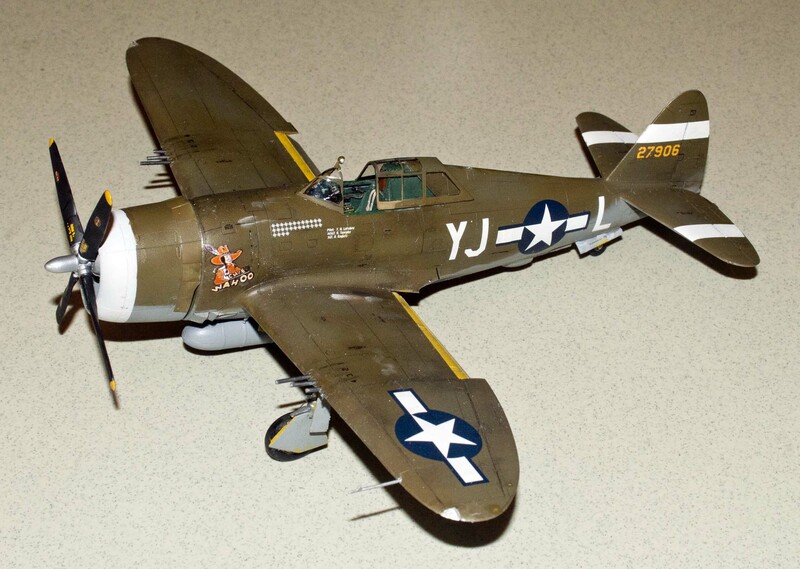 351st Fighter Squadron P-47D-1-RE 42-7906 YJ-L “Chief Wahoo”. He added a fuel tank. 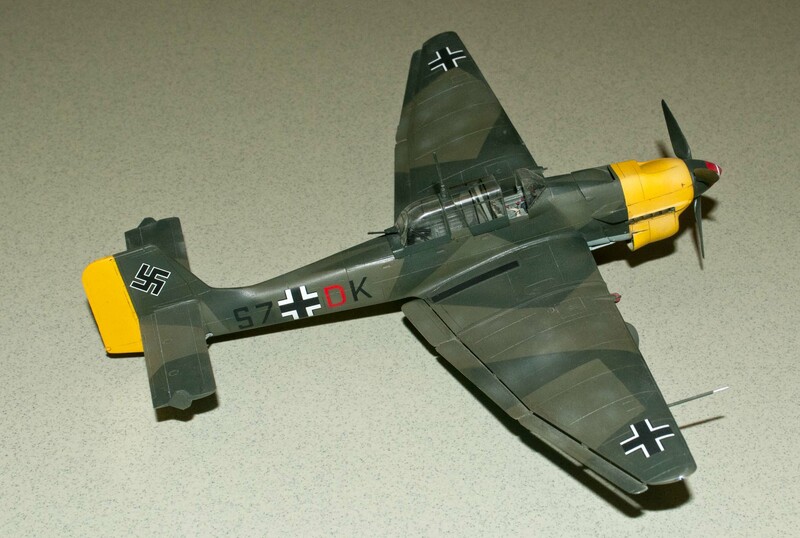 The model was built out of the box, using some photo etch seatbelts in the cockpit. 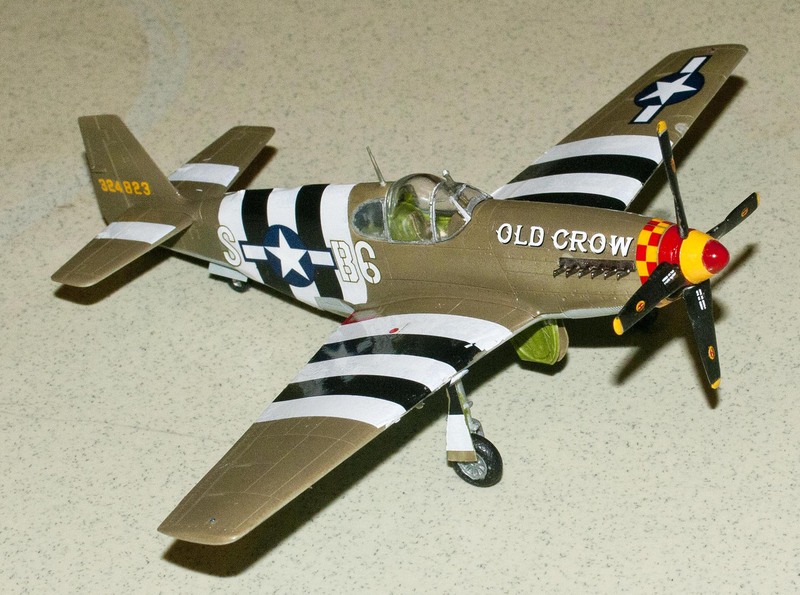 The model represents “Old Crow” flown by Bud Anderson. This was an easy build that went together well. It used the Malcolm canopy. 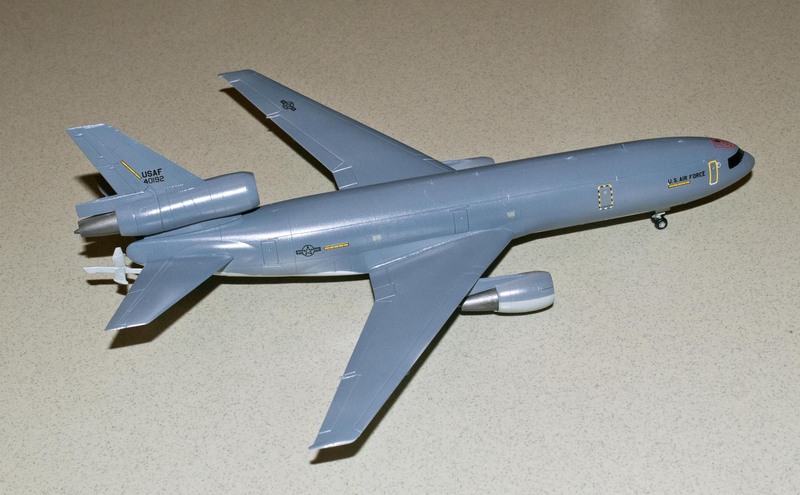 There were options for 3 other aircraft markings and the 2 different canopies. Model Master Acryl paints were used. 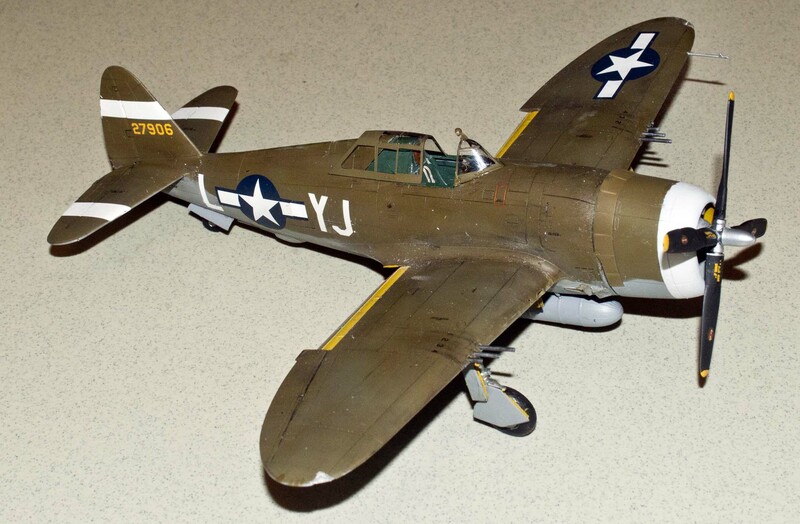 The only issue was that the Invasion stripes (white) were somewhat transparent over the olive drab paint. 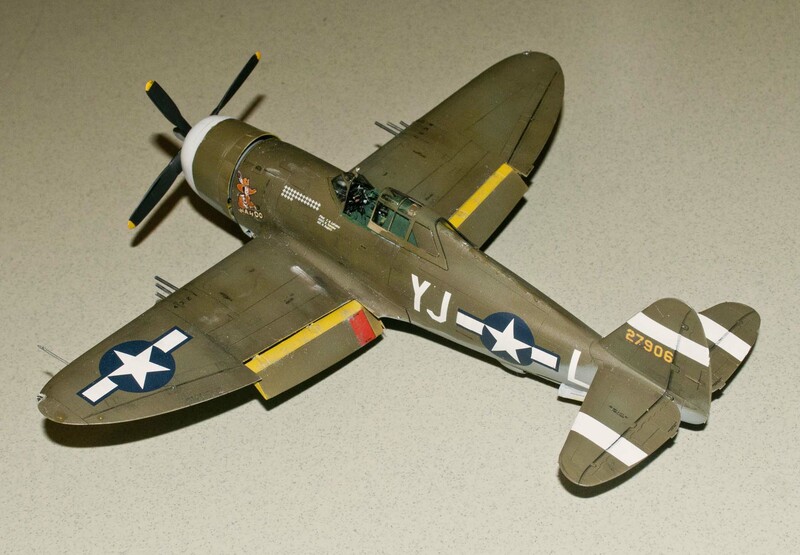 This model was purchased from Bill S. stash. 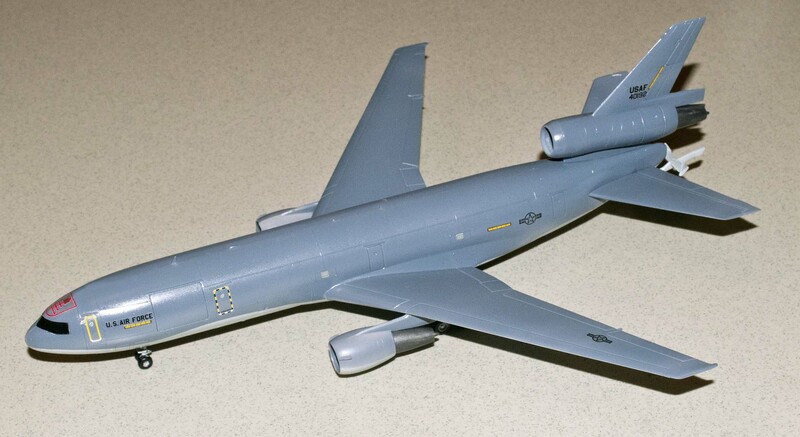 Paul’s been in the 1/144 scale mode for some time with USAF KC-135/707 derivatives’. Built the model OOB. It was a pretty straight forward build, no seams at the wing root. The landing gear was well thought out; the bogies could be assembled separately to make sure all the wheels hit the ground. Paul used Model Master Acrylics, with a Tamika Primer as the base coat. He finds that the Acryl paint won’t lift when using Tamika tape to use for demarcations.